Region: This bug is found in the southern region of the United States, except in the far west areas. Life cycle: This insect produces one generation each year. The adults overwinter in sheltered areas. Physical Description: This insect is dark brown with a yellow band across its 3/4 inch body, and its hind legs are flattened. The key-shaped eggs are white and laid on the underside of leaves. 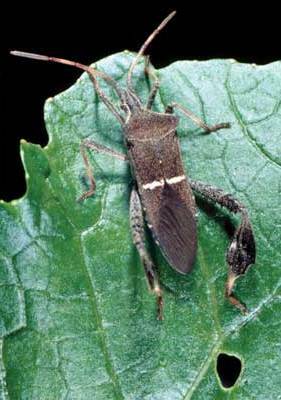 Feeding characteristics: This insect will attack the bean, orange, pea, peach, pecan, potato, and tomato plants by chewing the fruits and foliage. Controls: If the damage is intolerable, use pyrethrum or sabadilla dust, to control the problem.